If your child loves to take photos of cars and planes, this is the course for them! 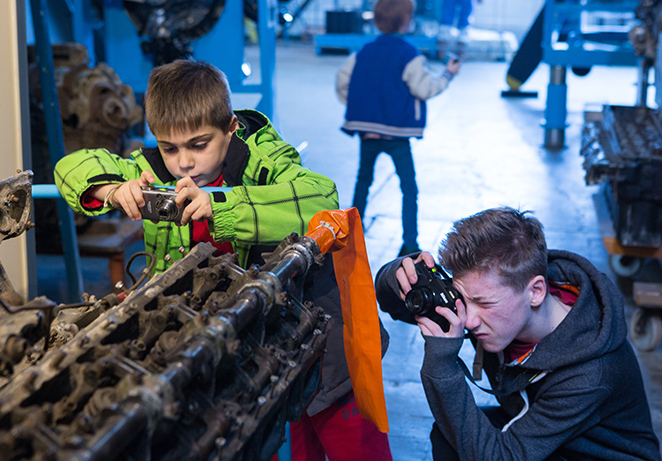 Our photography students will learn how to take a well composed, sharp photograph of all the amazing engines, planes and cars at Brooklands Museum. Using famous photographers’ photographs as illustration, we will guide the students through the various ways to compose a great photographic image. We will teach them how their camera works, and which settings are best to use in different situations such as photographing a still image (the Concorde) or photographing a fast moving classic car along the Brooklands track. Course takers will work with depth of field, fast and slow shutters, and perspective, capturing all the wonderful angles of the planes, cars and engines at Brooklands. Snacks and drinks are provided, and the children are also welcome to bring their own.